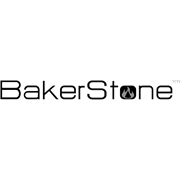 The BakerStone Basics Pizza Oven Box converts most 3-burner and larger gas grills into a Gourmet Pizza Oven. Reaching temperatures from 230°C to 400°C it can cook pizzas in 2-4 minutes. How does it work? Temperatures of a wood burning pizza oven are created by combining a stone baking chamber with an enamelled steel housing - this creates a unique airflow system enhancing radiant, conductive and convective heat in and around the cooking chamber. Not only can you cook the most delicious pizza in your BakerStone Pizza Oven Box - you can also roast meat, fish and vegetables, and bake breads and cookies. Fits on most 3 burner or larger gas BBQ's, as well as 57cm or larger charcoal kettle BBQs. Bakes pizzas up to 12" in size. 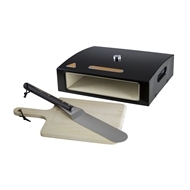 This kit comes with a Basic’s Pizza Oven Box, a pizza turner, and a wooden peel.